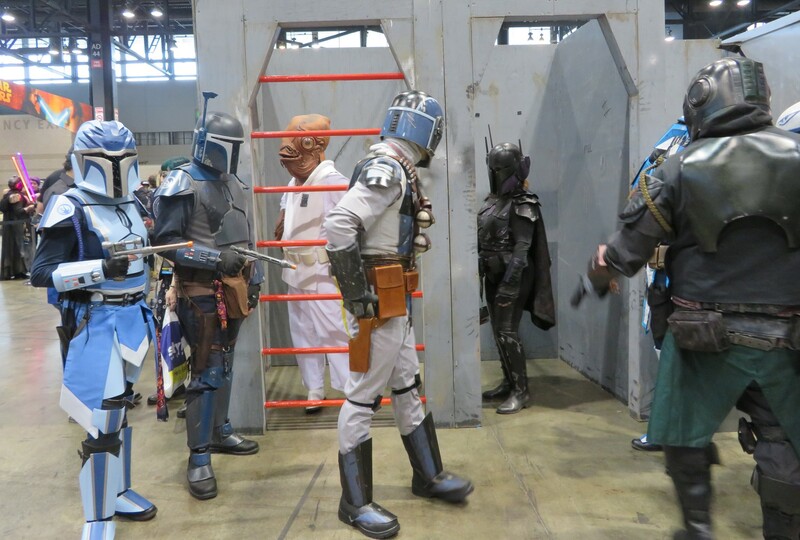 Star Wars Celebration Chicago 2019 Photos #3: Scum and Villainy Cosplay « Midlife Crisis Crossover! 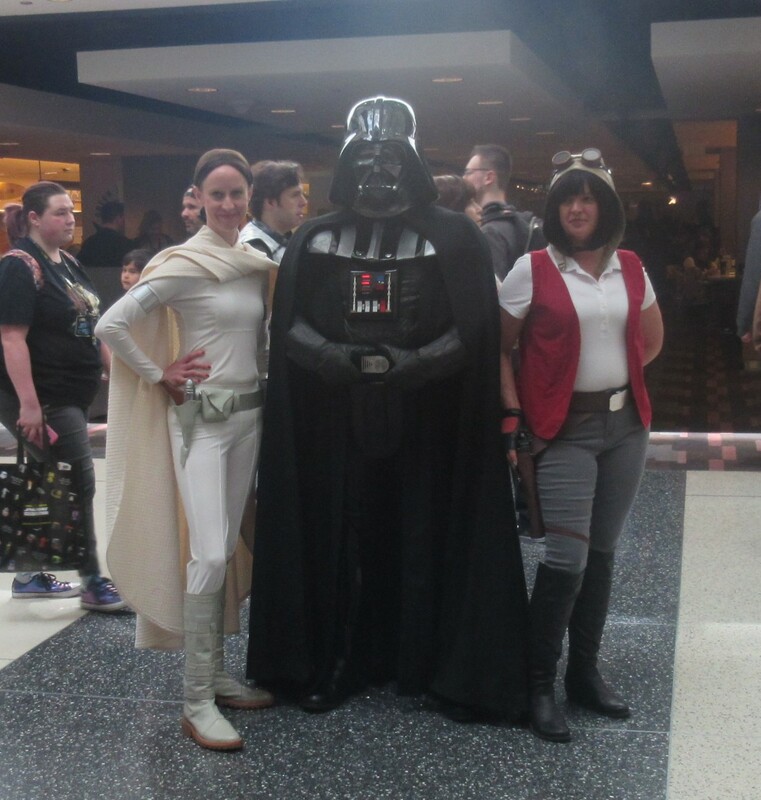 Darth Vader himself (plus his daughter!Padme) alongside his former hired hand Doctor Aphra. 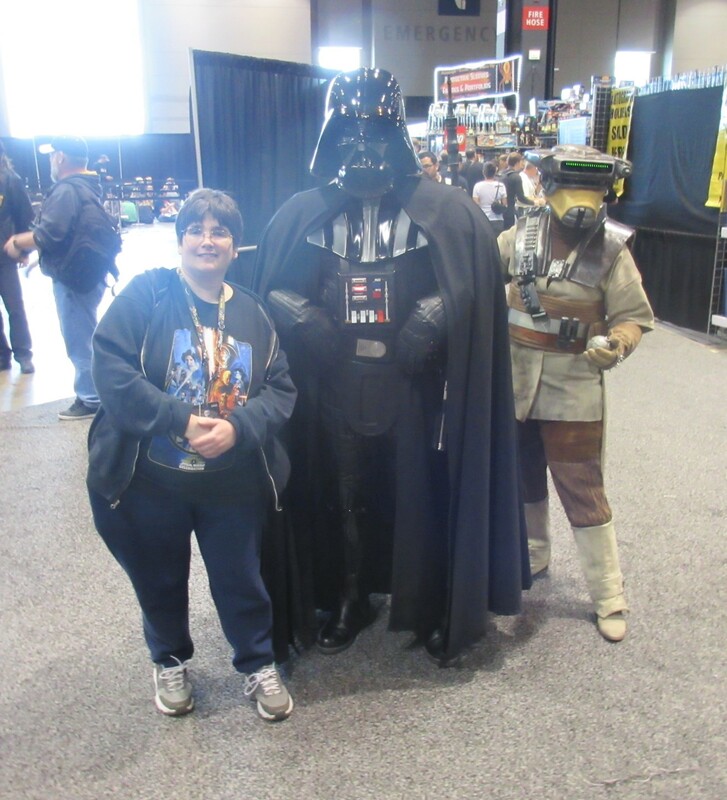 Anne wanted a photo with at least one certified classic Vader. Special guest Boushh was a bonus. 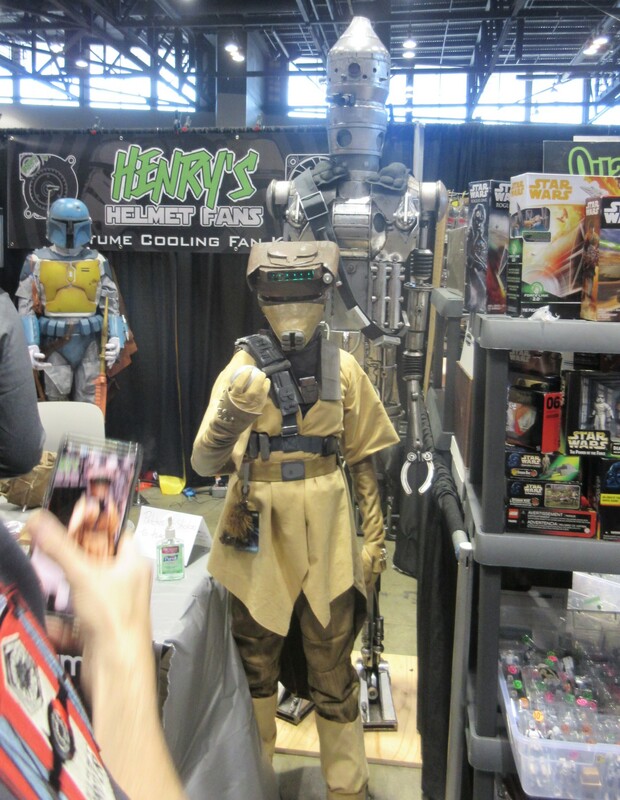 We also spotted Boushh working for one of the vendors. A booth Boushh, as it were. 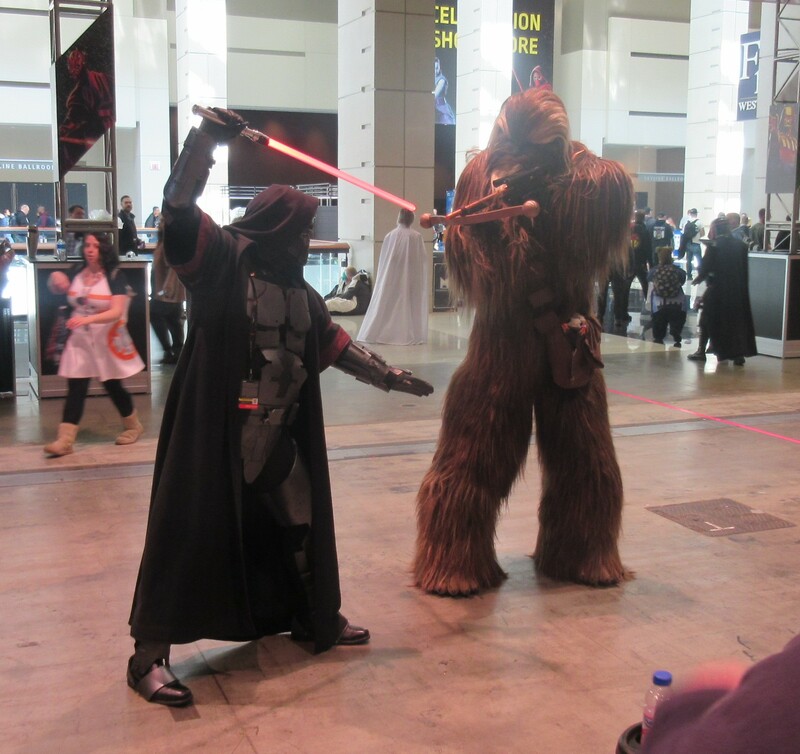 Darth Revan from Knights of the Old Republic proves his mettle by taking on Chewbacca. 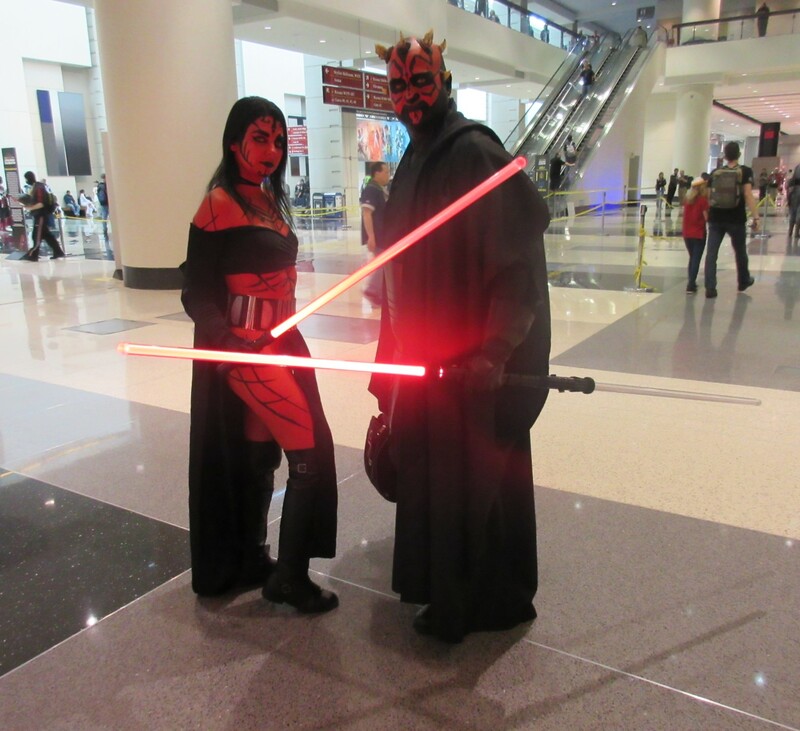 Revan’s rival Darth Malgus proves his mettle by taking on, uh, this one woman. You don’t know here but he swears she’s, like, totally formidable. 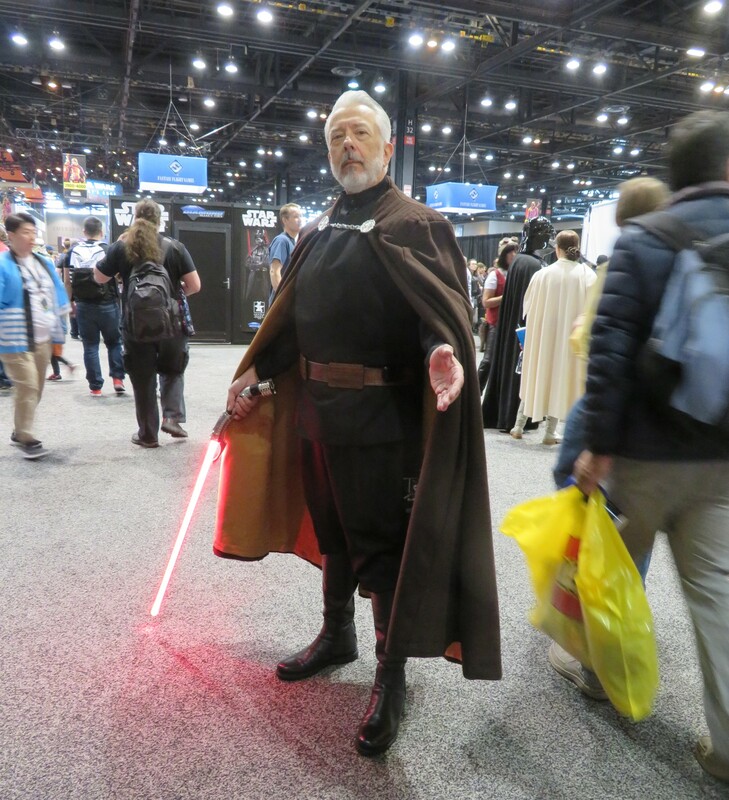 Count Dooku need not test himself to impress anyone. 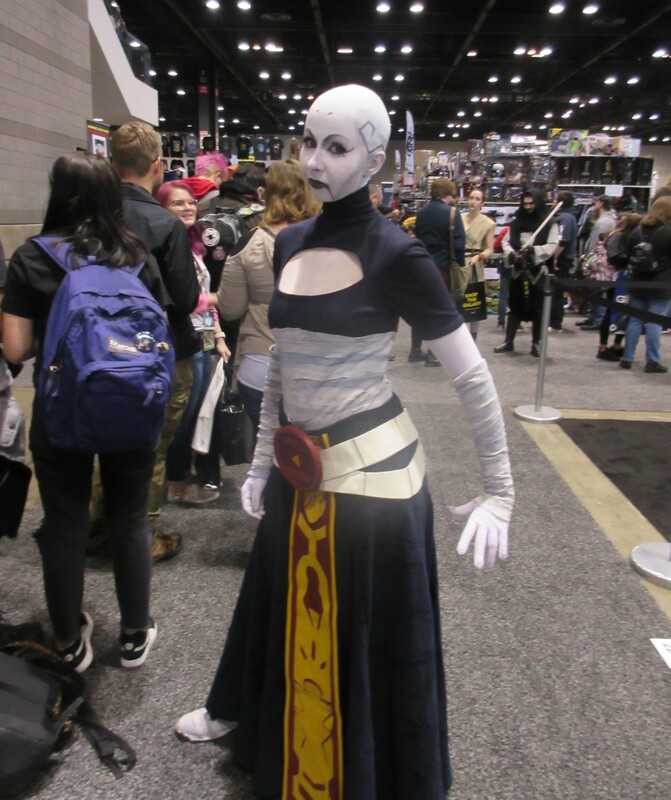 Asajj Ventress will test anyone who merely looks at her funny. 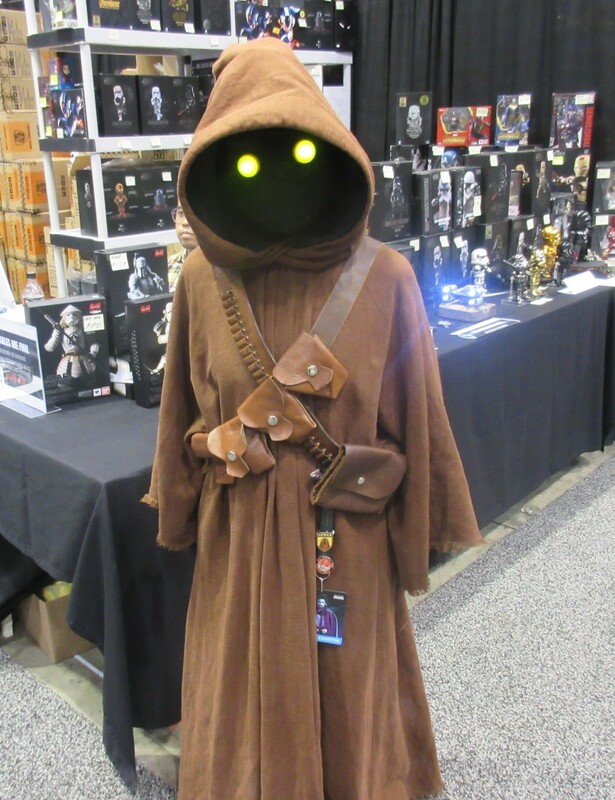 Jawas, known for using intense torture methods on droids, are basically cute tiny bullies. 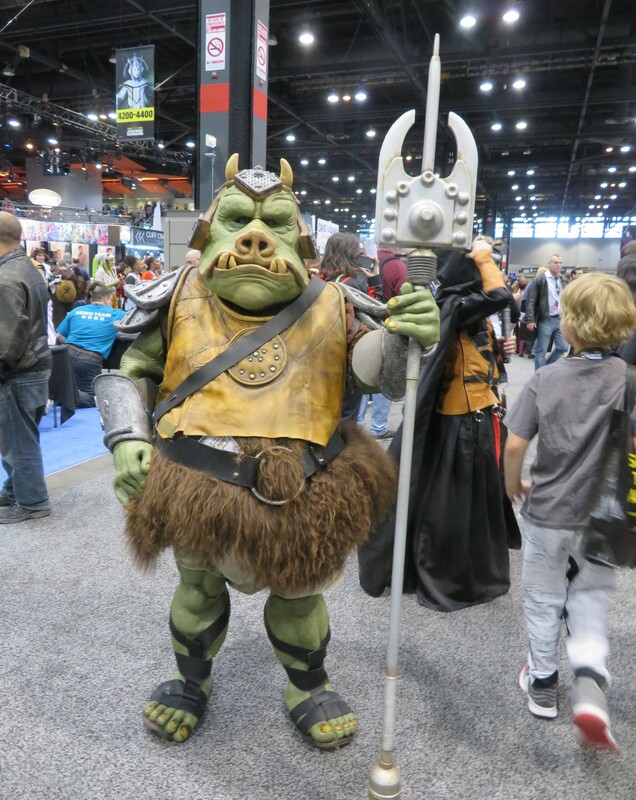 Gamorrean guard only pawn in game of life. 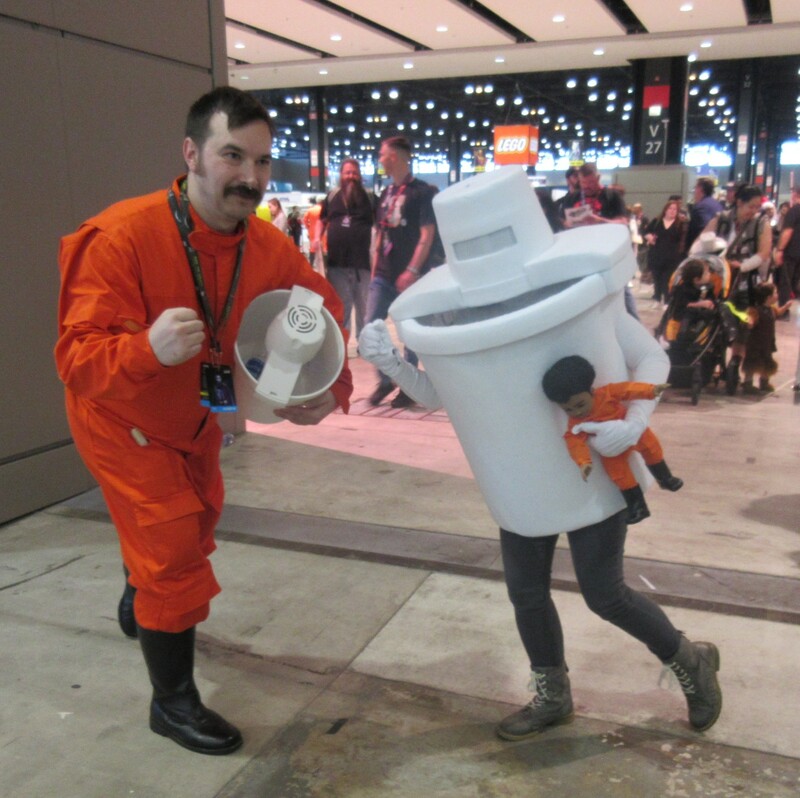 At most cons we end up with a small selection of photos I like to call “Stump the Olds”, in which we share photos of costumes that we thought looked somewhere between fancy and ingenious, and we took their picture even though we have absolutely no idea what character we’re looking at. If someone recognizes any of our next four subjects and can broaden our horizons by identifying them, that would be tremendously appreciated. 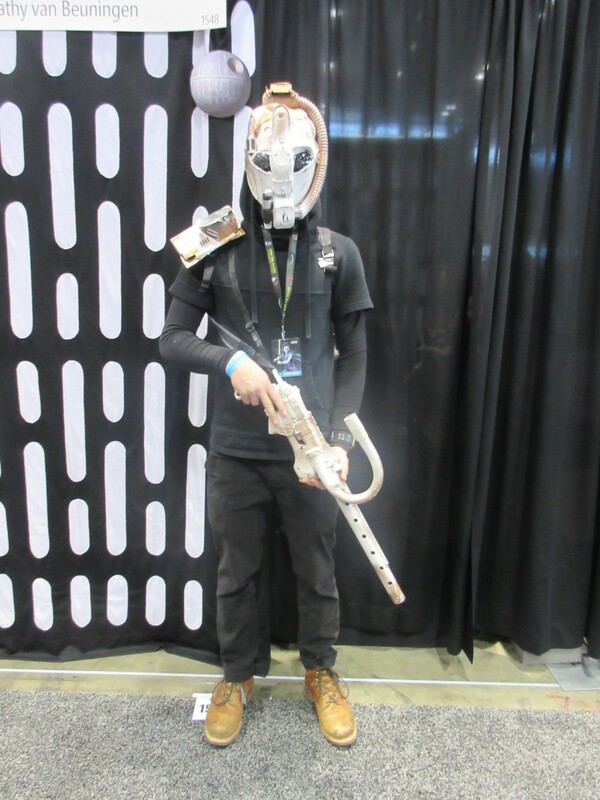 I’m not quite satisfied with posting blind, unlabeled, anonymous cosplay pics even though thousands of convention-cosplay photogs super-love doing exactly that on Instagram all the time. I aspire to be at least a smidgen better than that if someone’ll help cure my ignorance. 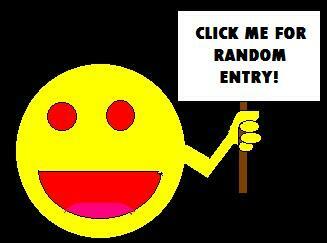 Much obliged! 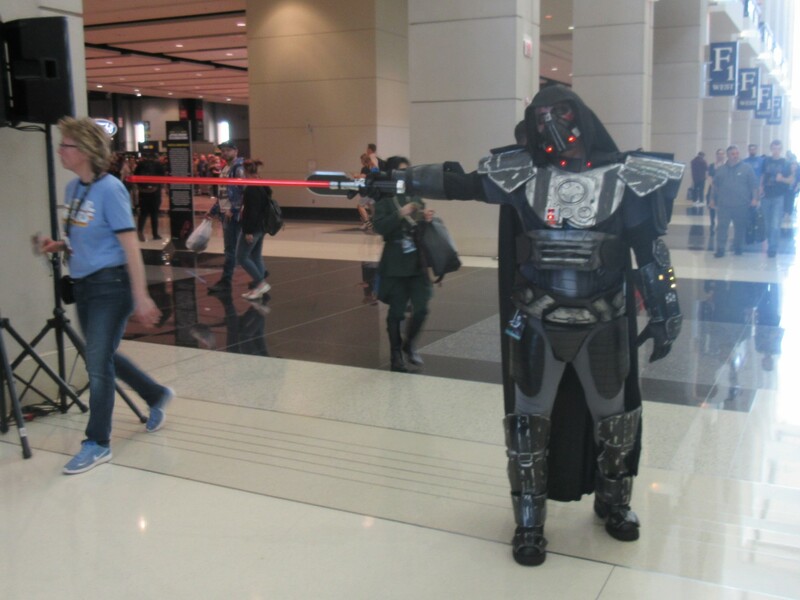 Star Wars assassin guard gunman guy. 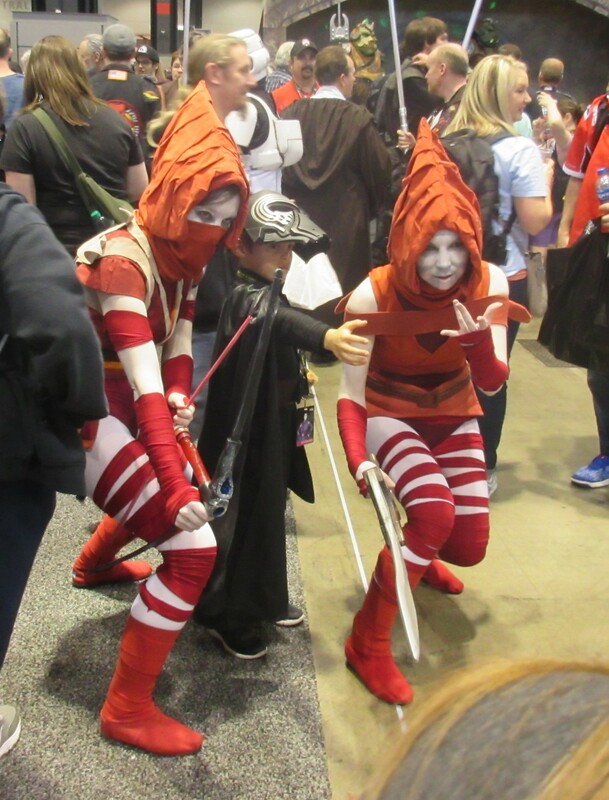 Mini-Kylo flanked by his Elektra Elves. 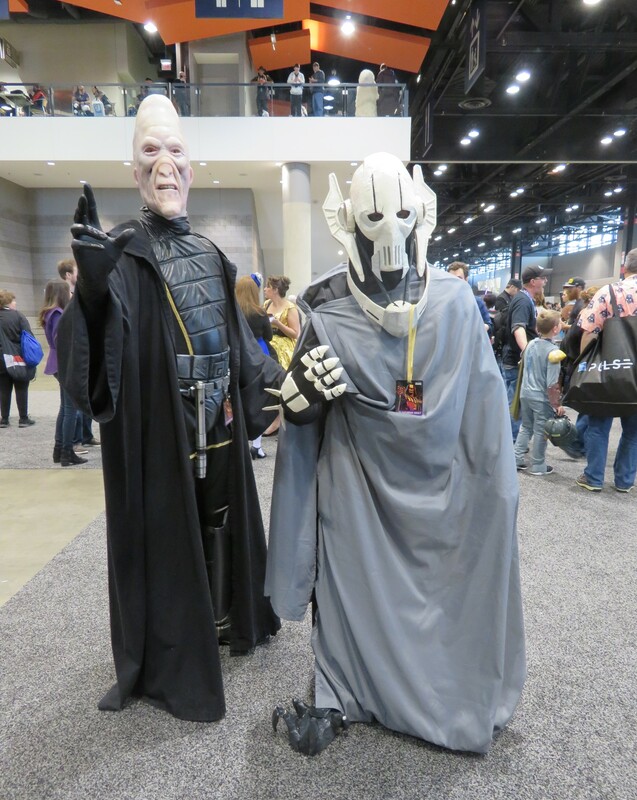 Grievous and a Cerean Sith Lord, possibly Ki-Adi-Mundi’s evil twin. 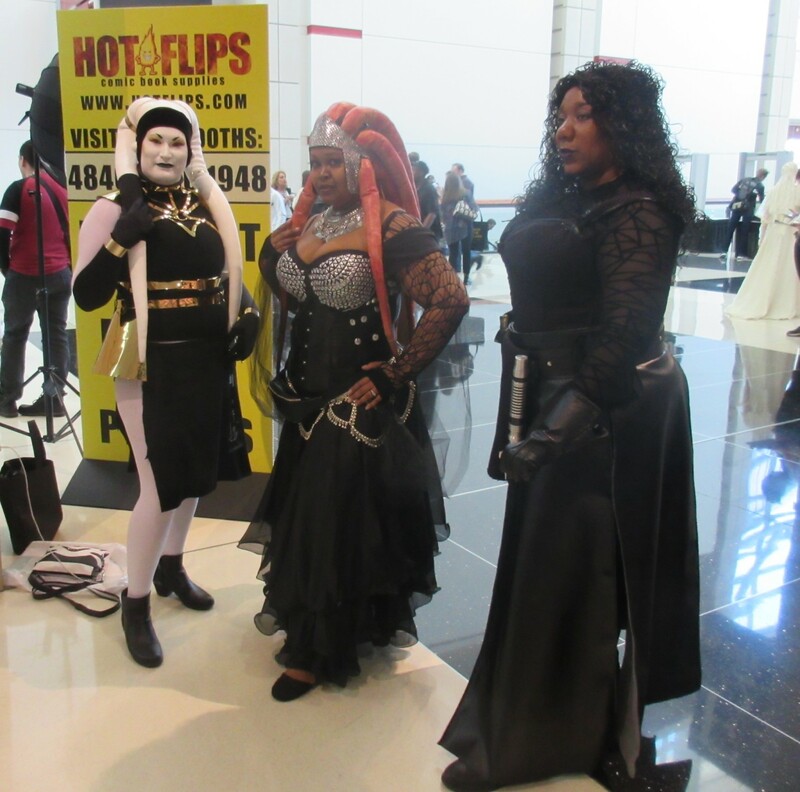 Two regal Twi’leks and a Sith Lady. 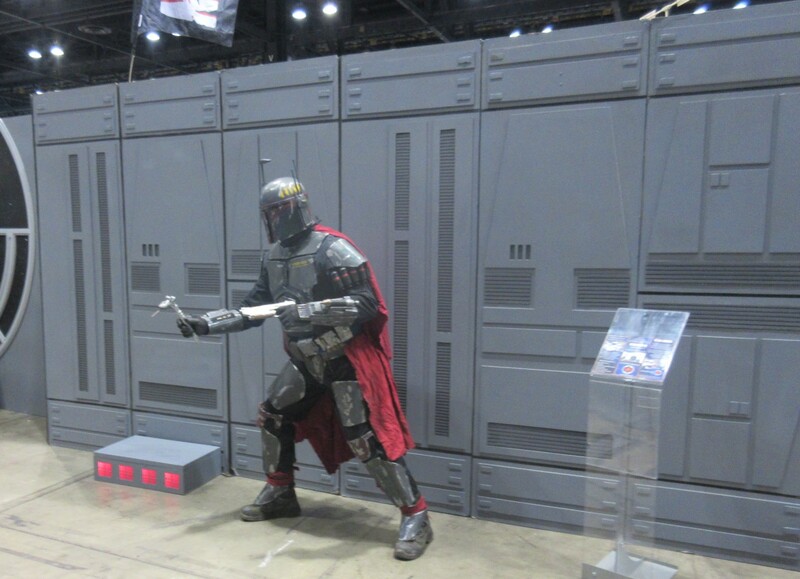 A Mandalorian, if not necessarily THE Mandalorian. 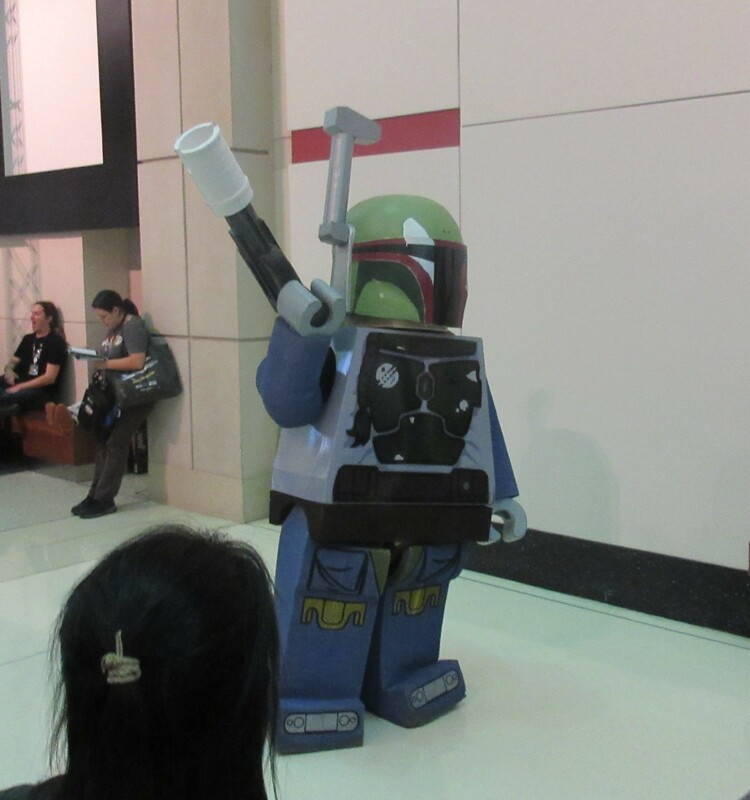 Lego Boba Fett from Lego Mandalore. 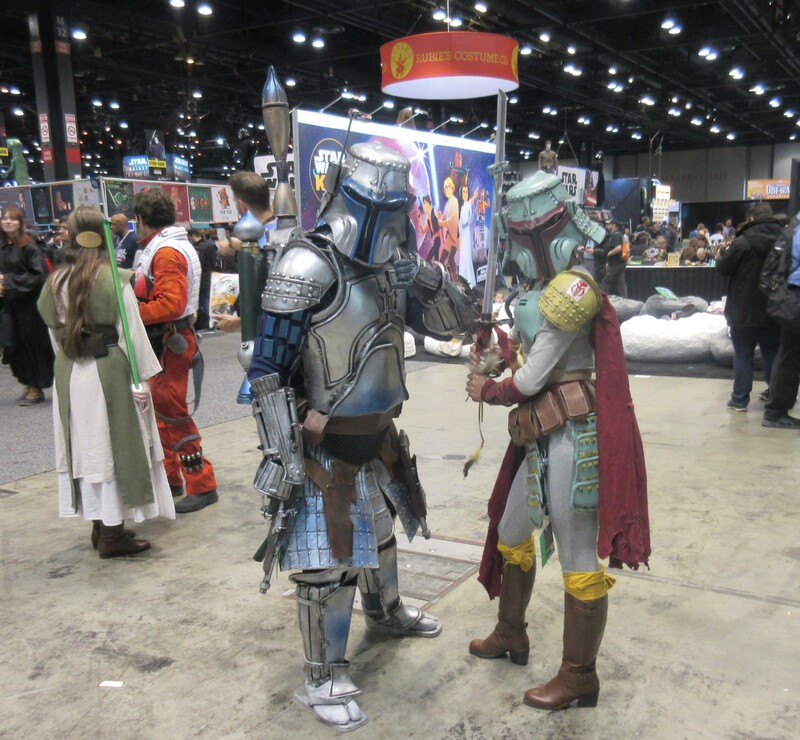 Medieval Jango and Boba Fett from medieval Mandalore. 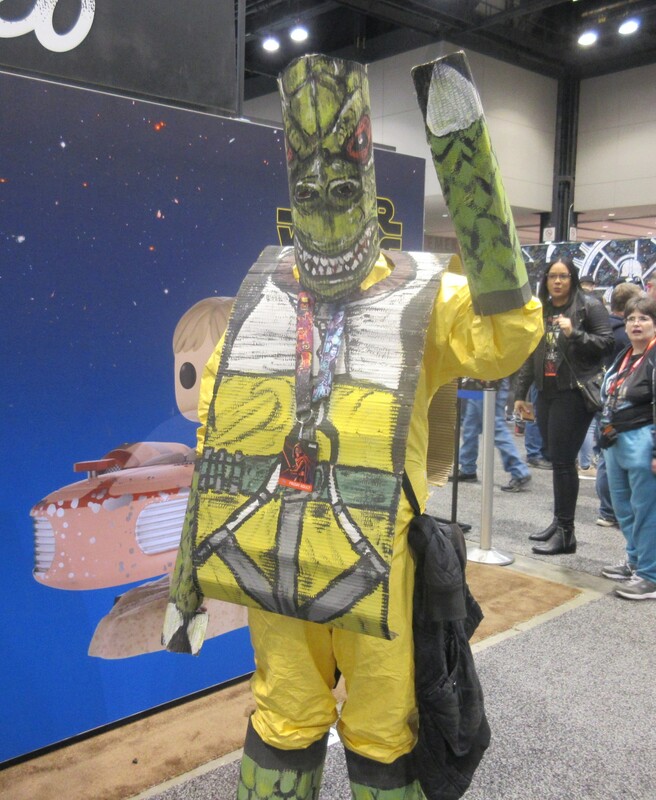 A rather corrugated Bossk from the Trandoshan box factory. 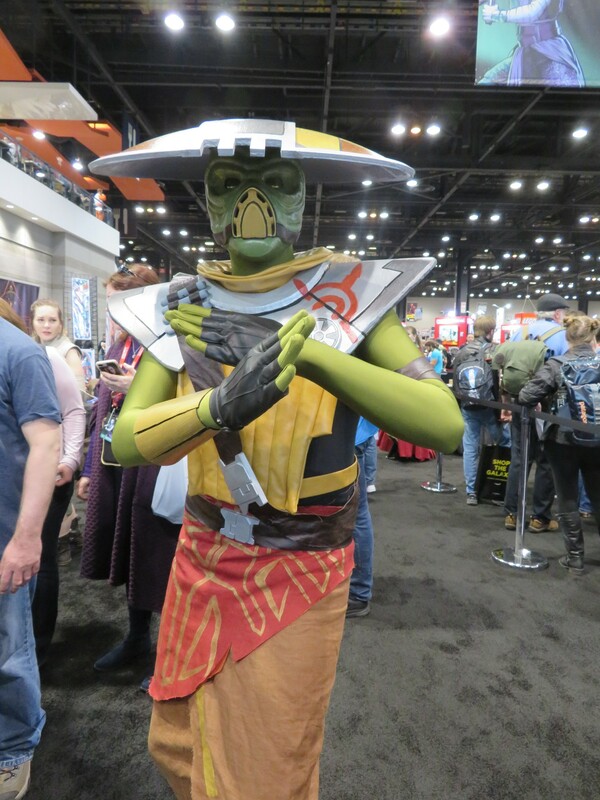 Another more recent bounty hunter, Embo from Clone Wars. 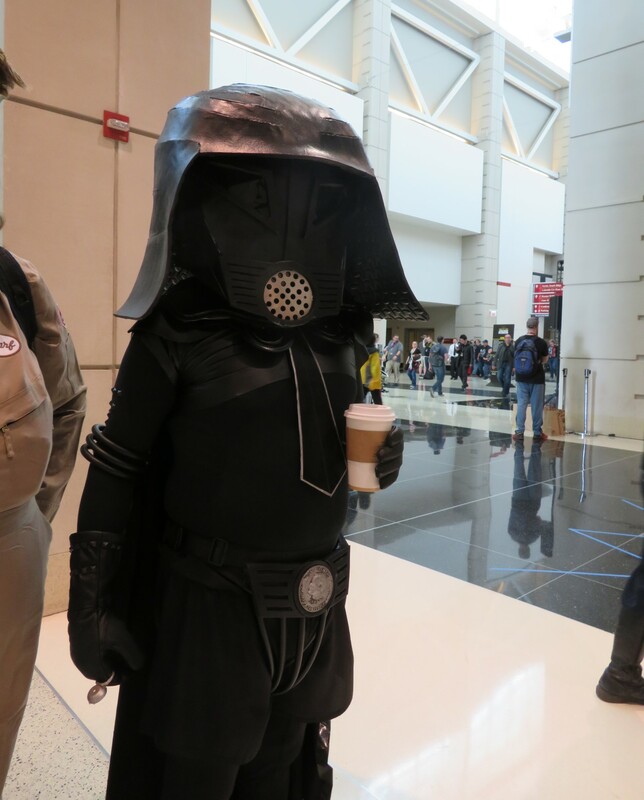 Dark Helmet! Ask your parents about this one if they haven’t already made you watch Spaceballs. Ice Cream Maker Guy and his Ice Cream Maker, teamed up with Ice Cream Maker and his Ice Cream Maker Guy. ICEPTION.